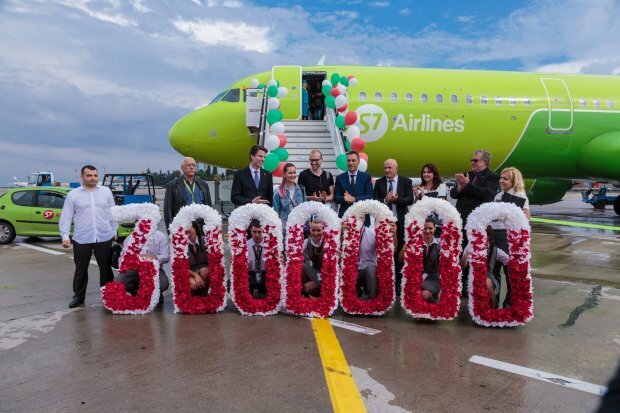 Burgas Airport broke a new record today as it welcomed its 3-millionth passenger with a flight by S7 from Moscow. The first eight months of the year were also record-breaking for the airport – by the end of August, 2 705 272 million passengers were recorded, an increase of 10% compared to the same period in 2017. The expectations are this increase to reach 12% by the end of the year. From Russia arrived today’s lucky passenger Anjelika Gromova, who, together with all of the others, was welcomed with ice cream, cake and a ballet performance upon arrival. She arrived with her husband and was greeted by Ulrich Heppe, CEO of Fraport Twin Star Airport Management – the company managing Burgas Airport, Georgi Chipilski, Director Burgas Airport, Dimitar Nikolov, Mayor of Burgas, Sevdalina Turmanova, Dep. District Governor and Krassimira Zhekova, Representative of S7 airline. The young family received many surprises, including a luxury suitcase. They vacation at Sunny Beach for the third time in a row because of the fantastic climate, people, the delicious cuisine and the local variety of fruits and vegetables. The couple was taken to the resort in style, with the unique BMW M760Li xDrive, which offers seats with eight massage options, a panoramic rooftop, handmade leather and many entertainment options. The vehicle was courtesy of Bova Car, the local BMW dealer. Airport data also show that 18 727 aircraft were serviced in Burgas by the end of August, which is about 8% more than last year. The most aircraft movements a day are recorded on July 27 – 256, and the record in terms of passenger load for a day is from August 10 – 40 932. The most passengers come from Russia (483 996), the United Kingdom (418 518), Germany (395 609), Poland (381 283) and the Check Republic (250 353). „Every season, the Black Sea airports welcome more and more tourists and attract bigger interest from international airlines. From the beginning of our concession, we have serviced 45.5 million passengers. We will continue to work hard to develop these airports and we are thankful for our partners from S7,” said Ulrich Heppe in an interview.